Need more reasons to join in addition to being a part of a key effort to sustain our local economy? 1) Get the scoop on who is coming to town. Your Visit Phoenix membership means you have access to our confidential convention calendar that provides you with the group name, meeting planner&apos;s contact information, meeting dates, headquarter hotel and number of attendees. It&apos;s the perfect resource to get your business in front of the decision makers. If you&apos;re a member who provides services directly to visitors, you will receive a listing in the Official Travel Guide for Greater Phoenix—distributed to 250,000 leisure and business visitors each year. Plus, if you want a few more eyeballs, advertising opportunities are available to members at a discounted price. 3) Potential opportunity to reach meeting planners. 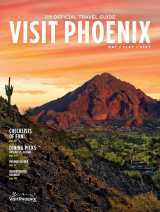 For members who provide services directly to meeting planners, you will receive a listing in the Meeting & Travel Planners Guide to Greater Phoenix. This guide is distributed to convention planners and corporate decision makers to help them choose the sites and suppliers that will make their Phoenix gathering a success. As with the Official Travel Guide, advertising opportunities are offered at a discounted price for Visit Phoenix members. 4) Win business through leads and referrals. Qualified leads and referrals are generated from our convention sales, convention services, travel trade and media departments. The leads are sent to members who can offer the specified type of service or product being requested. While we can&apos;t guarantee that all members will receive leads based on business category, this can be a major business booster for Visit Phoenix members. Through your membership, you will receive a listing page on VisitPhoenix.com that includes up to six photos, a 200-word marketing message, a link to your website, information on your amenities, and links to your social media profiles. You can use your page to post special offers such as packages and coupons as well as share event information.